ATLANTA (August 25, 2016) – August is National Water Quality Month in the United States, and Georgia Aquarium is highlighting the department that cares for our water quality on a daily basis. The Clean Water Act was passed in 1972, which established the basic structure for regulating water pollution in the United States. Water makes up approximately two-thirds of the earth’s surface, making it one of the prime elements responsible for life on earth. Georgia Aquarium’s Life Support Systems (LSS) and Water Quality Lab Departments work hard to make sure the water quality is perfect for all animals in their habitats. The LSS team works day and night to maintain the pumps, pipes and filtration systems that carry over 10 million gallons of water throughout the Aquarium to more than 100 habitats! In case of an emergency loss of power, Georgia Aquarium’s LSS team can operate on emergency power for one to three weeks in the event of an outage. The LSS team works with a network of computers that make millions of decisions per second, monitoring water parameters such as temperature, pH, and water levels, collecting data on thousands of points of information. Since Atlanta is a landlocked city, Georgia Aquarium uses city of Atlanta water to help fill and maintain each exhibit rather than use water from the ocean. Georgia Aquarium has six Saltwater Recovery Systems, which allow the Georgia Aquarium LSS team to reclaim and recycle water used in its exhibits. The LSS team also utilizes advanced filtration methods and techniques for keeping the water free of accumulating byproducts which ensure its healthy and safe for the animals. Roughly 99.5 percent of all exhibit water used at Georgia Aquarium is recycled. Each exhibit is tested in the water quality lab twice a day to make sure it remains at the safest and best standards for all of the animals. Around 5,000 tests are performed each week on close to 60 habitats. Each habitat at Georgia Aquarium operates as a closed loop filtration system, which means none of the habitats are connected to each other. To maintain the Aquarium’s 6.3 million gallon Ocean Voyager Built by The Home Depot exhibit, approximately 225 total pumps totaling over 5,000 horsepower are required. Through these pumps, more than 130,000 gallons of water is filtered and processed every minute. The filtration process mimics the wave action in the open ocean, allowing water to drain through the sand and catch particulates in sand filters as it would on a beach. 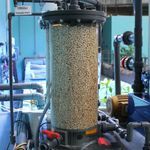 The filtration process also injects over 61,000 cubic feet of air per hour into protein skimmers where bubbles create foam and remove oils, residues, and animal waste from the water. Georgia Aquarium strives to help keep our waters clean and encourages all guests to do their part to help stop water pollution. Using non-toxic household products, avoiding dumping chemicals or trash into storm drains, and not flushing medication down the toilet or sink are a few simple things to help keep water clean. For more information about Georgia Aquarium, please visit www.georgiaaquarium.org. To learn more about Georgia Aquarium and how you can see the pump and filtration systems during a Behind the Seas tour, please visit www.georgiaaquarium.org/behind-the-seas-tours.